By Karol K. Sparks, Esq. As more and more banking organizations enter the insurance business, the line between banks and insurance agencies has virtually disappeared - in practice and in the eyes of federal and state legislators. The need has never been greater for a clear guide that explains the legal and regulatory limits placed on banks involved in insurance sales activities. 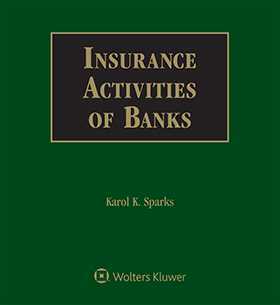 Insurance Activites of Banks, Second Edition provides authoritative coverage of insurance products now offered by banks plus the latest judicial and legislative developments, including the landmark Gramm-Leech-Bliley Act, that affect their activities. The various organization structures, such as bank holding companies, financial holding companies, financial subsidiaries, and how to choose the right entity for conducting insurance activities.